The Great September Gale of 1815 and the way we think about the weather. A 200-year-old storm demonstrates how the way we think about the weather has changed. An illustration depicting Westminster Street to the left and Market Square to the right in Providence, Rhode Island, during the 1815 storm. Two hundred years ago this week, the Great September Gale struck New England. The “gale” swamped the coastlines of five states with storm surges up to 15 feet. 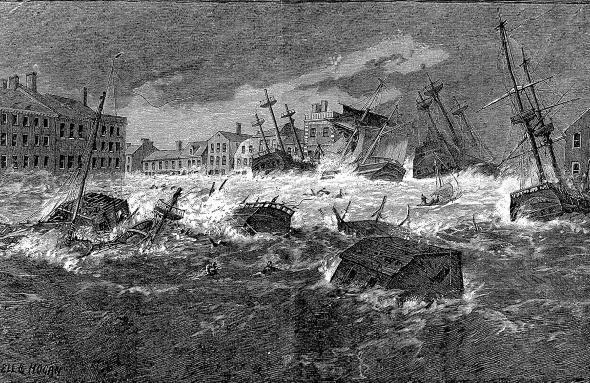 It reduced dozens of ships in Boston; Providence, Rhode Island; and other harbors to matchsticks and destroyed houses, churches, and barns from Long Island to New Hampshire. Forests were leveled, with trees torn up at the roots. High winds hurled broken glass, bricks, and slate roof tiles through the streets of urban areas. The storm bent the steeple of Old South Church in Boston. Most modern sources record the death toll at 38, but it could have been considerably higher. Though people didn’t use the word hurricane much back then, it assuredly was one, most likely a Category 4. The Great September Gale was the second major hurricane to strike New England since the coming of white settlers, and since that time, only the famous “Long Island Express” hurricane of 1938 is believed to have been more destructive. I came upon the Great September Gale while I was researching Americans’ perceptions of climate during the 1810s. This period is particularly interesting because the climate all around the world temporarily cooled for about a decade. And at the same time, many social institutions, including science, were in significant transition. The September Gale is one of numerous weather and climate events that people remembered and recorded, especially in their diaries. Some peoples’ descriptions of the 1815 gale took me back to a tornado I experienced as a teenager in Nebraska in 1988. After that storm, the streets of Omaha filled with branches and bricks, much like Boston’s after the gale. When I read a newspaper account, the centuries just telescoped into a common moment in time. Hurricanes have loomed large in our consciousness lately. Last month, the nation observed the 10th anniversary of Hurricane Katrina, an event whose meaning and legacy we are still quite painfully trying to evaluate. Unlike Katrina, the New England hurricane of September 1815 did not cause significant demographic shifts or provoke hard questions about our responsibilities to care for each other in disaster situations, but it does provide an opportunity to consider Americans’ attitudes toward storms—and our climate—then and now. Americans’ views about weather and climate in the 1810s were more holistic than ours today. Gales and tempests were related, many people thought, to phenomena like lightning, volcanism, and earthquakes. The 1815 storm occurred only a few years after the powerful New Madrid earthquakes in Missouri commanded public attention and less than a year before the bizarre climate anomalies of the “Year Without Summer” (1816)—which involved snowstorms in June and killing frosts in the dog days of August. In the 1810s, the idea of an “electric fluid” surrounding and suffusing the world—disturbances in which manifested themselves as earthquakes, waterspouts, hurricanes, and thunderstorms—was quite mainstream. “[A]ll observation convinces us,” wrote one author in an 1812 article in the Port-Folio, referring to this electric fluid, “that these phenomena are marked by its presence and arise from its agency.” For most people the Earth, the oceans, the atmosphere, and the heavens above it were all interconnected systems like those of a human body. We ask very different kinds of questions today about the weather—and they mostly concern the future. Is that tropical depression going to become a hurricane? How strong is it going to be? Where will it come ashore? Many of the factors that made Katrina such a painful experience involved this future dimension, centering upon questions about what authorities should have known or done in advance of the storm’s landfall. It’s right that we ask these questions; the people of Boston and Providence could not prepare for the 1815 gale in advance. When they talked about weather, their preoccupations centered mostly around agricultural concerns: when to plant your winter wheat and when frosts could be expected that might damage your corn. Their conception of future weather was vague and mostly cyclical, tethered very tightly to natural rhythms observed in previous seasons. For them, the most important weather was that of the past. Our current emphasis on weather in the future tense—and our reliance upon minutely specialized fields of expertise to explain scientific questions—has made it harder for us to appreciate specific weather events as part of a global ecosystem. Hurricanes are not a singular phenomenon. They are powered by warm sea-surface temperatures and set in motion by wind patterns. The scientific consensus is that industries and other human activity are affecting these processes, driving up sea-surface temperatures, increasing the intensity of hurricanes. Yet the connection between climate change and hurricanes is somewhat murky in the public consciousness because it’s impossible to prove that this individual hurricane or that one was “caused” by global warming. The compartmentalization and specialization of modern scientific disciplines has greatly increased our overall scientific understanding, but sometimes it makes it harder for us to see the forest for the trees. In 2015, we obviously know much more about hurricanes than we did 200 years ago, but looking back closely and carefully can be useful, too. History is more than a laundry list of problems or mistakes that we keep solely so we can avoid repeating them. Sometimes it’s a reminder that the view from the present can be more narrow and restrictive than the view from the past.